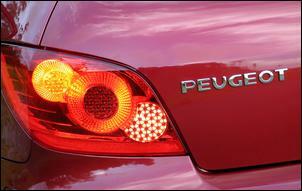 The Peugeot 307 XSE 5-speed manual is a car about which we feel ambivalent. It has some good points and it has some bad. Trouble is, often the good and bad are about the one aspect of the car. The door pockets front and rear are huge, but then when the front seat passenger leans forward and opens the glovebox, everyone gives a hollow laugh. 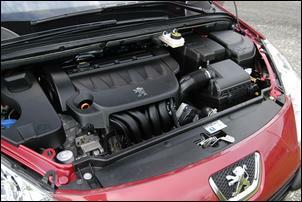 The open glovebox reveals that the lid could be half the size – the space comes pre-filled with a black box. Just as well there are underseat storage trays. At a glance the 307 is a practical, roomy car – then you find the front fold-down armrests are much too short - and are not adjustable for angle - and so are awkward to use; the centre console drinks holder won’t take even a small bottle; and the driver’s seat is adjustable only for rear height – the seat pivots around a front point and so the forward part of the seat cannot be adjusted up or down. (And we wanted it down!) Hmmm. 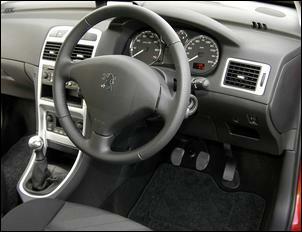 However, at least the steering is both height- and reach-adjustable. Or consider the engine. In city conditions the short gearing and 103kW 2-litre engine makes for good performance – the factory 0-100 km/h figure is 8.9 seconds. Add to that the excellent steering and tightly tied-down suspension (one of our drivers initially assumed that this was the sports version of the car) and around town, the Peugeot is nippy and fun. But get it on the freeway and that same short gearing means the engine is always revving hard, causing plenty of engine noise. Over joins in a concrete freeway, the ride bounces and jolts – simply, this is not a comfortable long distance car. And that’s despite a cruise control that digitally shows the selected speed, includes a speed limiter - and works very well. But on a twisting road, the 307 handles superbly, with bags of grip from its 205/55 Dunlop SP Sports worn on 16-inch alloy rims and plenty of throttle control balance available for the enthusiastic driver. Despite having no traction control, the Pug also gets its power down to the road without any fuss. The four cylinder engine, upgraded to Euro 4 emission specs in this new iteration, has peak torque at a highish 4000 rpm. Despite Peugeot claiming that 92 per cent of the 200Nm max torque is available from 2500 rpm, we found it pretty easy to catch the engine off-song, often necessitating a quick down-change after planting the right foot didn’t do much. (However, the engine in the test car was very young.) Rev the engine hard and response is much better, but a dreadful booming cabin resonance above 5000 rpm limits practical performance unless you’re deaf or have the sound system turned way up. The gearbox and clutch are fine. The interior equipment looks excellent in this $28,990 price range, with six airbags, active front head restraints, an auto-dimming rear vision mirror, auto-on headlights, auto rain wipers, and dual climate control. But we found the climate control quite slow to respond to hot conditions – after starting the car that had been sitting in the sun, the fan always needed to be manually cranked up to bring the in-cabin conditions down to the selected temp. Unlike previous Peugeots we’ve driven with auto wipers, at times those on this car seemed to develop a mind of their own. The 307 XSE is very much a car that presents well on the showroom floor and in a drive around the block. The looks, the equipment level, the fast steering and ease with which the 307 changes direction, all these things (and a price of under thirty grand!) make for a persuasive case. But the more that you drive it, the more irritating become its faults. Don’t any of the designers at Peugeot wear good sunglasses or large shoes? Wasn’t the climate control ever tested in hot conditions? What’s with the paint quality? 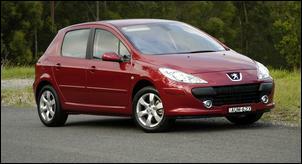 Apart from its excellent equipment level, the 307 XSE has no killer advantage over its competitors. Its brother HDi models – which feature a brilliant turbo diesel engine – can point to their exceptional fuel economy and almost undiminished performance. With its 130kW engine, the 307 Sport has performance on its side. But despite the 307 being a former European Car of the Year and having sold exceptionally well, we don’t think the XSE is anything to rave about. There are just too many faults without sufficient advantages to comprehensively offset them. 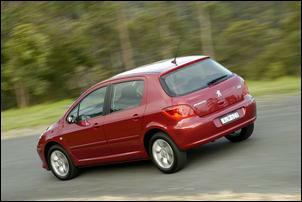 The 307 XSE was provided for this test by Peugeot Australia.